I am pretty sure that one day Adam Sandler woke up and said "I'm going to make a movie about myself and my twin sister, and I'll play both parts! It'll be hilarious!" He then roped as many celebs as he could into playing cameos (which were admittedly funny, for the most part) in order to boost the star power in the film, and then marketed it as a comedy that was sure to be hilarious. Unfortunately, Jack and Jill was far from hilarious, and I spent most of the movie wishing that it would end. Jack Sadelstein (Adam Sandler, Just Go With It) dreads the holiday season because for him it means one thing: his twin sister, Jill (also Sandler) comes to visit. 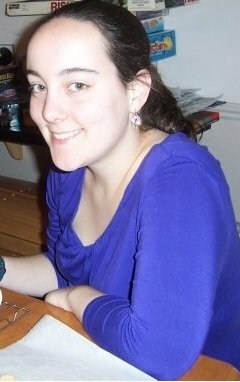 Jill is loud and obnoxious, but luckily lives across the country in New York, so she only comes to visit once a year. Jack's wife (Katie Holmes, The Romantics) and kids love seeing Jill, but unfortunately Jack does not. Jack is a PR exec, and while Jill is in town, he is trying to recruit Al Pacino for a Dunkin' Donuts commercial. Jack brings Jill with him to a Lakers game that he knows Al will be at, and Al meets Jill and immediately develops a crush on her. This might or might not be good for Jack, but Jack is determined to milk it for all it's worth, and he asks Jill to stay a few extra days, through New Years'. If the above description sounded zany to you, it gets even better: there were a ton of celebrity cameos in the film, from Regis Philbin, to Johnny Depp, to David Spade in drag, and they are about the only part of the movie I enjoyed, especially at the end of the film when Jack's Dunkin' Donuts "Pacino Dunkaccino" commercial is shown; I admit to laughing a lot during that. Unfortunately, the rest of the movie was awful, although I may be in the minority with this opinion; some people at the screening said they thought it was funny. I didn't like Sandler's characters at all, and I'm not entirely sure why Katie Holmes agreed to do this movie, as she could do much better. Al Pacino plays a prominent semi-comedic role in the movie as himself, which was interesting but not entirely funny. I'm guessing that he thought he could "branch out" a bit from his usual gangster/serious roles with this movie, but it didn't really work that well. Other cameos included Shaquille O'Neal, an almost unrecognizable Drew Carey hosting The Price is Right, Christie Brinkley, and Jared Fogle (yes, the Subway guy). The movie is also offensive to Jewish people (which Sandler probably felt he could get away with, since he's Jewish, but I wasn't laughing), Indians, and overweight people, among others, though I suppose you could argue that this is just Sandler's type of humor. Example: there's a bit where Jack says his daughter (who is white) is a whiz with computers, and Jill remarks that she thought his son (adopted, and Indian) would have been better with them. Normally Adam Sandler movies are "hit or miss" for me, but I enjoyed the last film I saw him in (Just Go With It), and so even though the trailer for Jack and Jill looked awful, I was hopeful that it might be funny. I was grossly disappointed, however, and even though a lot of the cameos were pretty funny (especially Spade's and Johnny Depp's), I would say No, don't see this movie. 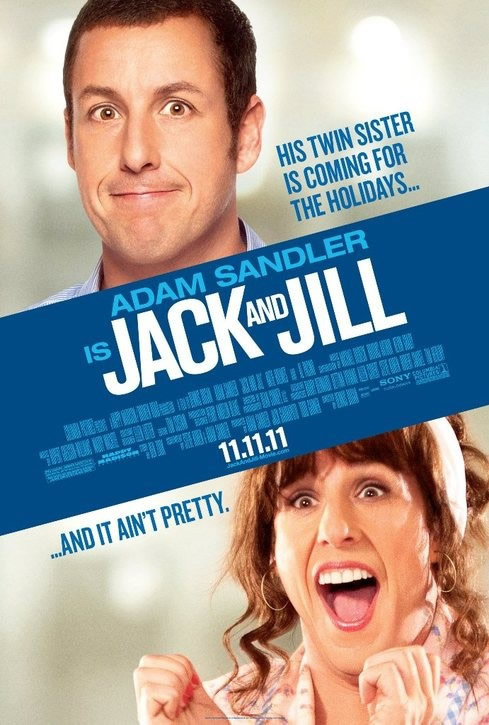 Jack and Jill is in theaters today, November 11th, and is rated PG with a runtime of 90 minutes.